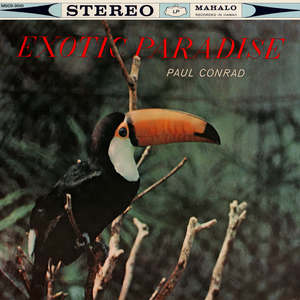 Paul Conrad may not have been a household name in the world of Exotica, but his influence on Exotica and Hawaiian music of the 50's and 60's is huge. Conrad was the pianist for the Gene Rains Group. He left the group after Rains' "Lotus Land" LP and recorded this album. He also arranged quite a bit for Martin Denny and Arthur Lyman as well as working with Ethel Azama and writing charts for a teen Bette Midler who took the charts to New York for auditions. Here we finally have Conrad's only Exotica album digitally for the first time. The album audio quality is excellent and the album art is preserved. HOWEVER there are a few special notes to consider: In countries outside the US, some download services offer the album with alternative artwork that looks like stock beach photography. In the US. iTunes offers the album, but with the song titles mixed up and not on the correct songs. The song order itself is true to the original LP, but the song titles attached are completely incorrect. In other countries, the song titles are attached to the correct audio song, but the order of songs is different. The album has never been released on CD.